With a lovely timelapse video showing off his map-making skills. 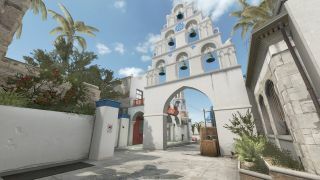 You'll know the name FMPONE if you've ventured into Counter-Strike: Global Offensive's Steam Workshop—he's the mapper behind Cache, Crown, Season, and other environments generally regarded as the best CS:GO community-made maps around. Now, he's detailed his most recent map, Santorini, in a fun making-of video showing how it progressed from a basic greybox into the stonking, believable location you can download here. If you've not been to Santorini, it's a bomb defusal map set in the identically named Greek island, and sees you battling terrorists intent on destroying the Greek economy. A couple of years ago, Shawn 'FMPONE' Snelling and Sal 'Volcano' Garrozo (why don't I have a cool online-handle middle name?) detailed the making of Crown, in a three-part series for PC Gamer.